This is the yo-yo that started it all in the USA. If yo-yos were catalogged like stamps, this one would be #1. Pedro Flores, an immigrant from the Phillipines, start a company making these toys from his homeland. Donald Duncan noticed the toys ability to draw a crowd, and the rest is history. One piece wooden design and undersized, it also had a very very thin gap. These were lathed out by hand and even each half of this one piece wooden yo-yo is a little different in shape. 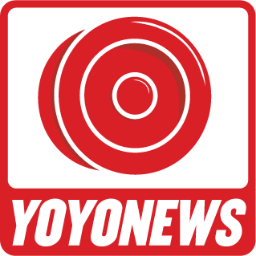 The string was a slip string, an innovation creditted to Donald Duncan, but apparently a part of Flores yo-yos before the company was sold. 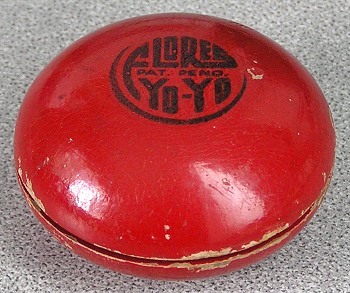 This is an original Flores yo-yo from the late 1920s, red gloss with a black ink stamped logo.